Safari Ltd Toobs have arrived at Battlefield Legends Toy Soldiers! 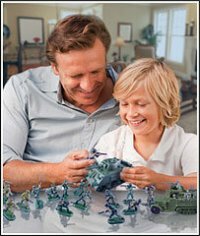 These classic action packed toobs will delight the imagination of any student or toy soldier collector. 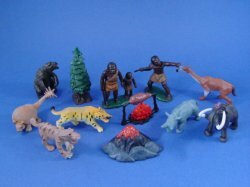 Set includes: Pine Tree, Caveman Throwing Spear, Cavewoman and Child, Doedicurus, Volcano and Lava, Fire and Meat Roasting, Macrauchenia, Andrewsarchus, Saber Tooth Tiger, Wooly Mammoth, Giant Sloth and Arsinoitherium. All Safari products are phthalate-free and safety tested. 100% satisfaction guarantee. Shop with confidence!